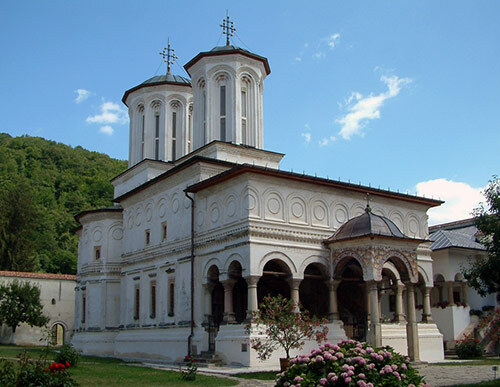 Located in Valcea County, at the foot of Capatanii Mountains, Horezu Monastery is considered to be the most representative construction in the Brâncovenesc style. 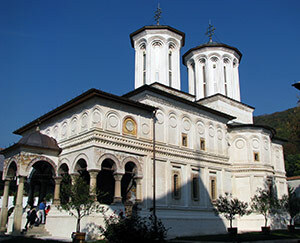 The place of worship, with Saints Constantine and Helena as its dedication day, was built between 1693 and 1697, during Constantin Brancoveanu’s reign. 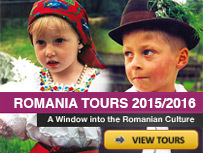 Since 1993 it has been included in the UNESCO patrimony. 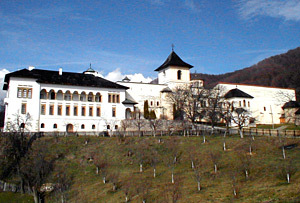 Horezu Monastery – Vâlcea County. 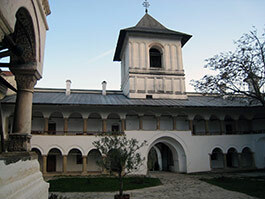 The entire monastic complex covers more than 3 hectare, and includes the monastery, the Bolnitei church, founded by lady Mary (Constantin Brancoveanu’s wife), built in 1696 and painted by Preda Nicolae and Ianache, then the Holy Apostles’ Hermitage, located 50 meters to the North, founded by the great archimandrite Ioan in 1698 and painted by Iosif and Ioan in 1700, and also the Saint Stephan Hermitage, named after the ruler’s oldest son, built in 1703 and painted by Ianache, Istrate and Harinte. 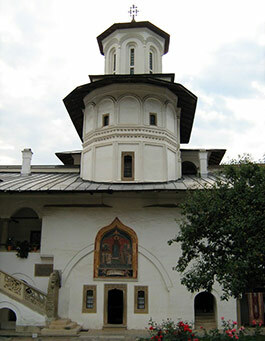 The entrance in Horezu Monastery. The name of the monastery comes from “huhurezi” (eagle owls), a species of night birds with coloured plumage. According to the legend, the workers hired to build it, out of the Turks fear, were forced to work only by night, when the eagle owls were singing. 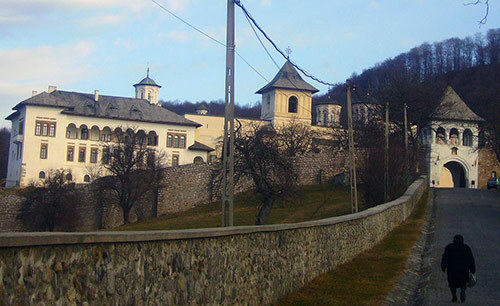 The church of the Horezu Monastery – Valcea County. 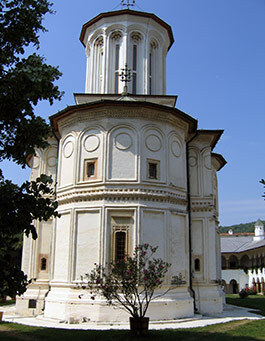 The church of the monastery is 32 meters long and 14 meters high, and can be considered an approximate replica of the Curtea de Arges Monastery. Entering the church goes through exonarthex. On the left you can see The Last Judgment. In the beginning, the monastery was for monks, but in 1872 it became a nun monastery. Over 60 000 tourists visit it every year, but the greatest pilgrimage is on Easter. 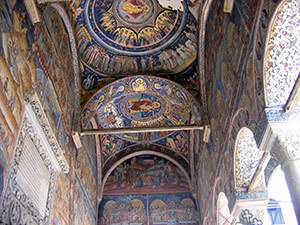 Charles Diehl, specialist in Byzantine art, considered it „Le plus beau de toute Roumanie”. In 2005, Prince Charles of Great Britain himself spent 3 days in one of the cells of the monastery. Horezu ceramic – Cucuteni 5000, Iasi. Pottery, which is a millenary traditional occupation, has been and will be a prosperous activity in some parts of Romania. Since ancient times, the farmers have adopted pottery as a complementary activity. Step by step, the most talented peasants have specialized themselves in the art of pottery and they have succeeded to impose themselves through this skill that has been handed down from generation to generation. “Hurez ceramic” became a brand long time ago. 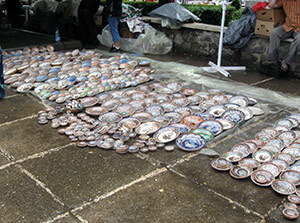 The Horezu ceramic center has been and continues to be a true leader of the Romanian ceramic folk creation. 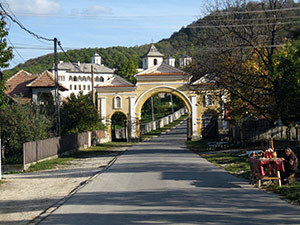 The village of Olari from Horezu commune has always been recognized as a specialized center in ceramics. The potters from Horezu realized in the beginning regular vessels that they would sell at the fairs organized in the vicinity of their village or they would give to the waggoners who would sell them in some other villages. Usually, the trade was made outdoors (several vessels in exchange for maize, poultry or animals). The notion of “regular vessels” comes from the fact that these vessels were used in everyday usage. Later on, their usage limited only to rituals, as they were used for funeral repasts or for Saturday before Whitsuntide (mosi). The vessels were not decorated, but there were only a few enameled stains of color on them. The vessels used for consuming had to be fine and easy to use, to be resistant and hygienic as well. Besides these characteristics, the vessels had to please the eye and the soul. As accommodation possibilities, the monastery offers 20 accommodation units in a mini-hotel, in rooms with one or two beds, and also in three rooms with four beds in the attic. The yard at Horezu Monastery. In the yard at Horezu Monastery. 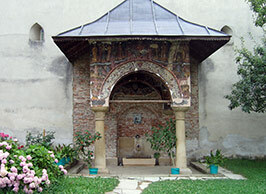 The church of the Horezu Monastery. Do you have the holy relics of st. Philopater Mercurius? My wife and I, Japanese pensioners, would like to have a room in your monastery on the 14th of July. Please tell me how to make a reservation. Please,let me know if you have a room for one in Sept. this year. Onlybtwo nights. I would like to stay at your monastery for two nights in September this year. What are the options? Do you have a room for one person? Costs? Programme? Meals included? Thank you very much for your kind attention to my requests. I am interested in staying in October, just one person. Is it possible to get more information? 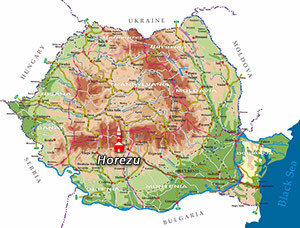 I am enquiring to see if it is possible to stay for a night at your Horezu Monastery for Thursday 9 September 2010. I would want a double room for my wife and I. Please let me know how I can book and what the cost would be for 2 people. Do you supply dinner and breakfast also? 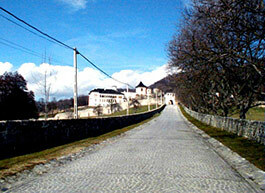 I would like to ask you if it is possible to stay for one overnight at your monastery in a single room from May 4th. HOw can I book? we would like to know if it is possible to have accomodation for one night for 4 people in 2 twin rooms on august 8th. My wife and I would like to stay at your monastery on next Monday the 31st of September. How can we reserve a room? would love to book for sometime in september or october. two female university students. 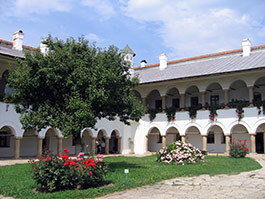 A group of 9 Bulgarian people would like to stay at Horezu monastery for an overnight at either 20th or 27th June. Are there vacant rooms, 4 double rooms and a single room? We are a couple and we would like to sleep in your monastery. How could we reserve? I would really like to stay with you in May – can i book? ?